After 5 weeks of near glimpses and lots of early morning calls we were finally treated to some impressive views of not one, not two, but four Resplendent Quetzals hanging around near Base Camp. Resplendent they were too - the male (as probably described previously) has amazingly long tail feathers and the female isn’t too shoddy either with turquoise green body and a red front. Unfortunately it was still difficult to get a decent photo, but one of the more adventurous birders - a Cuban called Ernesto - headed off into the jungle, crossing rivers and clambering up trees to obtain the photo below. Perhaps not quite as impressive as they are in reality, but it gives you an idea! Whilst examining a pretty little tree frog with a head four times as large as its bottom, a branch loudly and violently fell off a close by tree. This is the second time this has happened to us in a few days. It’s a risky business, looking at frogs. Curiously, the falling tree/branch problem is very similar to the iceberg flipping over issue, which I am more familiar with. Both happen very infrequently, but must sometimes happen. For our first day’s fieldwork at Cantiles we embarked upon the interestingly titled Transect 5. The reality of this path is much more special than its name with superb forest, fine birds & flowers and a challenging path that makes you know you are alive. 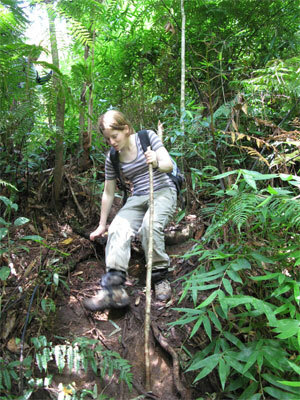 After watching Fiona stumble and slide a couple of times our guide took pity and chopped down a tree to create a walking stick, complete with three very small pet bromeliads. This helped most of the time, until she concentrated on holding this stick rather than sticking to the ground, and slid horizontally, feet first, backwards down the path. Here she is desperately trying not to slide on her bum (again). On the way home we successfully negotiated our way past a couple of baby (but deadly) Godman’s Pit Vipers but at the last hurdle both got viciously attacked by wasps. We both ran screaming from the nest area much to the amusement of Roo and Lamia who had uneventfully passed them and had moved on to Resplendent Quetzal watching. We struggled with binoculars, pain and anti-histamine, narrowly avoiding a sticky mess and enjoyed this most finest of birds for a few moments before the pain got too great and we resumed screaming. You will be pleased to know we are fully recovered after the tender care and attention of Roo, an A&E nurse. On Friday I celebrated my birthday with a nice long walk (back up the previously mentioned horrible muddy trail) doing bird counts with Chris at 5am. 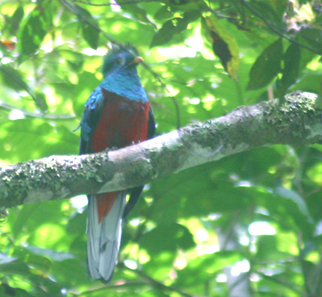 A Quetzal kindly made an appearance to wish me Happy Birthday, and we got to walk along probably the most pretty, if most difficult, transect I have done yet. 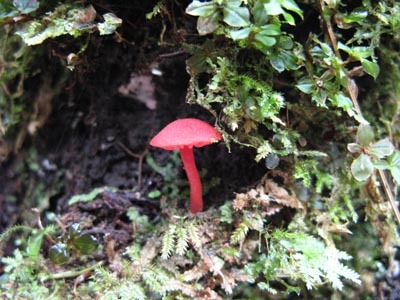 The transect took us to 2,100m elevation and provided some wonderful views over the rest of the forest. 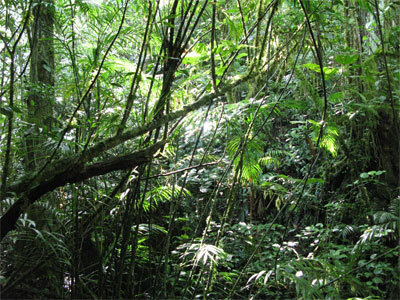 It also contained the elfin forest - “Bosque Enano” which is completely different to the surrounding, enormous trees of the rest of the forest. It was a truly special place with lots of moss and lichen - seemed very lord of the rings or some such, although disappointingly no birds. After staggering back to camp (literally in my case), we went up to the nearby river for a much needed wash - it was a wee bit chilly, but almost fine once you got under the water completely! We then had a celebratory chocolate bar and a nice afternoon nap. In the evening I was surprised with a nice cake that had been prepared all afternoon. What was more surprising was that they managed to make it with the limited cooking facilities available - the cake tasted lovely though and was topped by some innovative candles made from “magic wood” - a type of pine which smells very nice and in theory lights easily, except when on a birthday cake apparently! Since it was a bit burnt on the bottom (due to the innnovative cooking methods) I found a machete to be the best form of attack. It really did taste good though! Over the last few days I have been on another small break from base camp and ran away with Chris (well, actually walked quite slowly) to another satellite camp called Cantiles. Everyone who’s been there has come back saying it’s nice, but muddy, although we weren’t quite prepared for how true this turned out to be - it was rather treacherous to have so much mud on a slope of a considerable gradient - Glastonbury eat your heart out! I was always amazed when I made it from my tent to the kitchen without slipping on my bum! The walk there was quite an experience too - luckily I had quite a small pack but it was a long trek that involved more mud and numerous undulations - hopefully I will be superfit by the end of this (although somewhat doubtful). The camp itself was lovely - the most jungly camp so far with lots of huge trees ( there is a 50 metre tall Liquidambar in the kitchen), a couple of pet Chestnut-headed brushfinches (Chris is teaching me well), and the occasional Quetzal - yes, we have finally had a couple of good views of them, though no photos as yet. We ate plentifully as the camp is due to close soon and had copious quantities of food. Chris is desperately trying to get fat after the harsh comments on his Guanales post! He made great inroads on the Cantiles Cheese Mountain and did some damage to the excess cornflakes & jam. Fiona and I went out counting birds at Guanales early one morning. 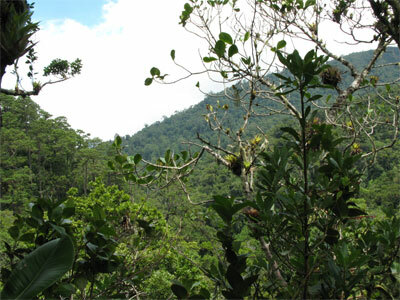 We were at a site at the end of a truncated transect (the transect had been shortened due to an illegal coffee plantation and the frequent presence of an armed gentleman). I had just begun a point count and was diligently listening for birdies when we heard voices coming from the path above us. They sounded like school kids so Fe set off at pace (would you believe she ran up the hill?) to ask them to please be quiet - science was in progress, after all. 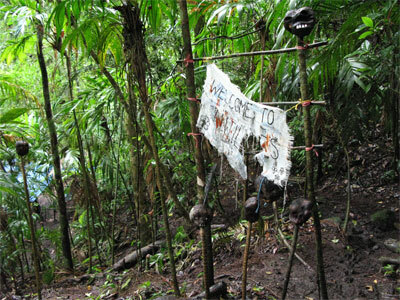 On her return she gingerly announced there was a man with a gun and another with a large machete just up the path and they were most definitely not school kids. I’m not sure what she said to them, but it worked and they remained perfectly quiet for my census, before passing us and exchanging pleasantries. 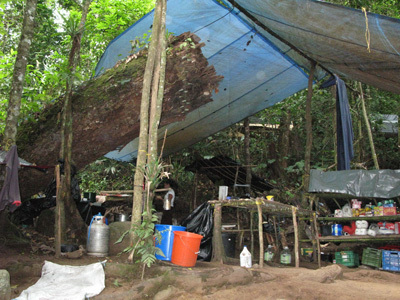 I’ve just spent the last week at a field camp called Guanales. Fiona came too for a couple of nights. 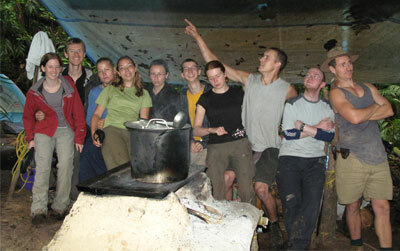 Guanales is about 1.5 hours walk from Base Camp, up a gradual hill, then down a very steep hill. It’s at around 1250 metres above sea level, so is warm and sunny-ish. The best thing about Guanales is its showers - hollow bamboo pipes extending horizontally from the top of a small waterfall direct a powerful jet of water outwards creating the most powerful shower I have ever experienced. Privacy was somewhat lacking, but the setting was marvellous. A close second to the showers comes the newly created play park. 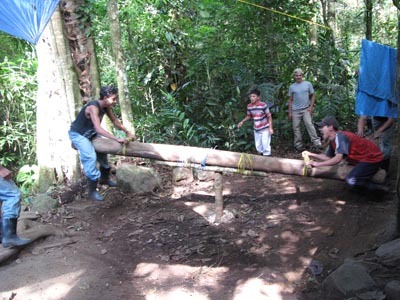 Bex, an invertebrate person, learnt the Spanish word for a see-saw, so asked the Honduran forest guides if they could build one. 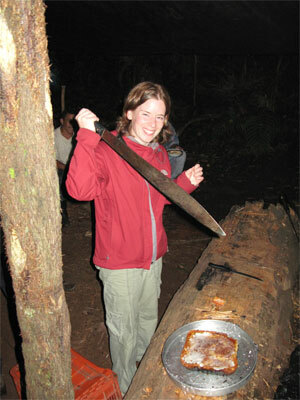 They were happy to oblige and created a fine see-saw from forest products with machetes. This see-saw is special however. It has the revolutionary new feature of rotating on its pivot, as well as going up and down in the traditional fashion; a see-saw crossed with roundabout, if you will. It goes fast too. Every play park should have one. The play theme continued with the introduction of an adult sized swing and a pull-up bar (would you believe I am near the top of the chart of number of pull ups in one go - I am a super hero after all). Guanales even has its own custom made Opwall Monopoly, again made with natural forest products. 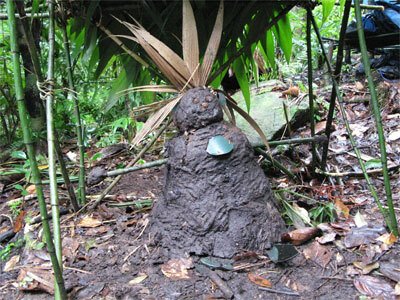 Science seemed to take a back seat to play for a while as herpetologists and bromeliadologist combined forces to make chess pieces from bamboo. Once complete I suspect a chess board will be etched on the dinner table. 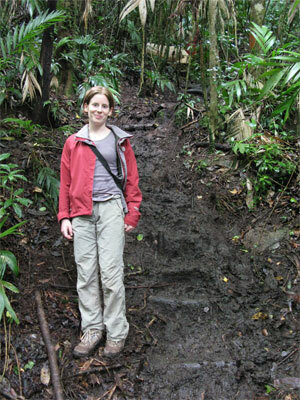 At El Danto I encountered several deadly snakes each day as I walked the through the forest to my bird survey sites. Indeed, an Emerald Palm Viper (small, green, but with enough oomph to kill you in a few hours) took up residence just a stones’ throw from my hammock and stayed for several days. Sounds dangerous doesn’t it? Fortunately, most of the venemous snakes here are rather lazy and don’t actively pursue prey. They sit and wait until their prey conveinently strolls past them, then one bite does the trick, wait for the beast to die, then gobble it up. When they encounter humans, they mostly shuffle off quietly and considerately. They are quite cryptic however and occasionally I executed 10 minute bird counts whilst standing right next to a Godman’s Pit Viper. Once I very nearly put my bag on one; I suspect the mighty MacPac would have lived. This is a Godman’s Pit Viper, fangs at the ready.